E-mail continues to be the weapon of choice for mass delivering malware. The tools and techniques used by attackers continue to evolve and bypass all the security controls in place. These security controls could be a simple home based UTM device or a big corporation security infrastructure with all kinds of technology. Social engineering methods, combined with latest encoding and obfuscation techniques allow e-mails to be delivered straight to the end user mailbox. These phishing e-mails attempt to steal confidential data such as credentials using all kinds of deception techniques to lure users to click on links or open documents or give their information. In the last days I came across some of these documents. The below steps describe the mechanism behind one of these documents (MD5: 4a132e0c7a110968d3aeac60c744b05a) that when opened on Microsoft Office lure the victim to enable macros to view its content. Even with macros disable many users allow the macro to execute. What happens next? The malicious document contains a VBA macro. The macro is password protected. The protection can be bypassed using a hex editor and replacing the password hash with a known password hash to see its contents. When executed the VBA macro writes 3 files on disk. A batch file”ntusersss.bat”, a VBS script “ntuserskk.vbs” and a powershell script “ntusersc.ps1”. The trojan is executed and the machine is infected. The following picture illustrates the previous steps. The downloaded malware is very sophisticated and is known to be a variant of the Feodo ebanking trojan (aka Cridex or Bugat). This trojan contains advanced capabilities but the main feature is to steal credentials by performing men in the browser attacks. These credentials are then used to commit ebanking fraud . After execution, the malware contacts the Command and Control server and the machine becomes part of a botnet and starts capturing and stealing confidential data. Another new document used recently in several phishing campaigns it also uses a VBA macro inside the word document (MD5: f0626f276e0da283a15f414eea413fee). But this time the VBA code is obfuscated. 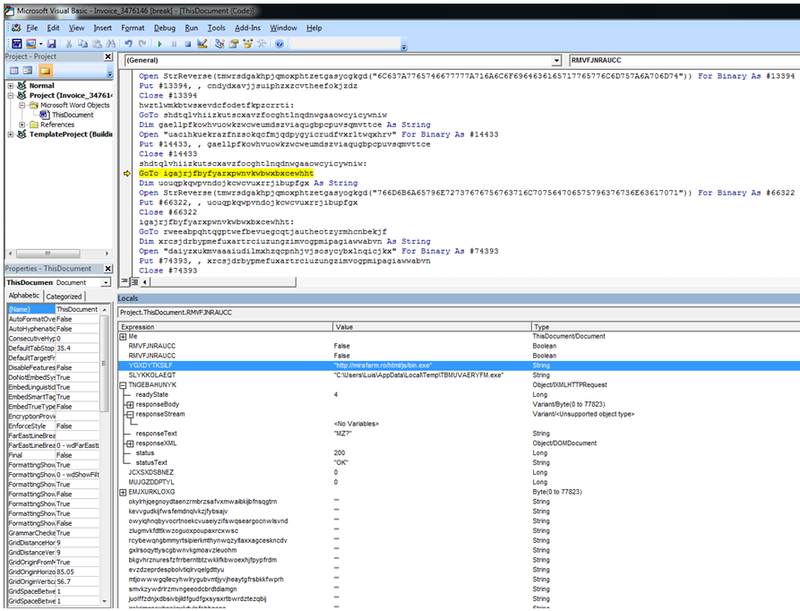 Using the Microsoft macro debugger its possible to execute in a step-by-step fashion and determine what it does. Essentially it downloads a malicious executable file from a compromised website and then it executes it. Again, after execution it contacts its Command and Control via HTTP. The computer will be part of a Botnet and it will start to steal credentials and other confidential data. 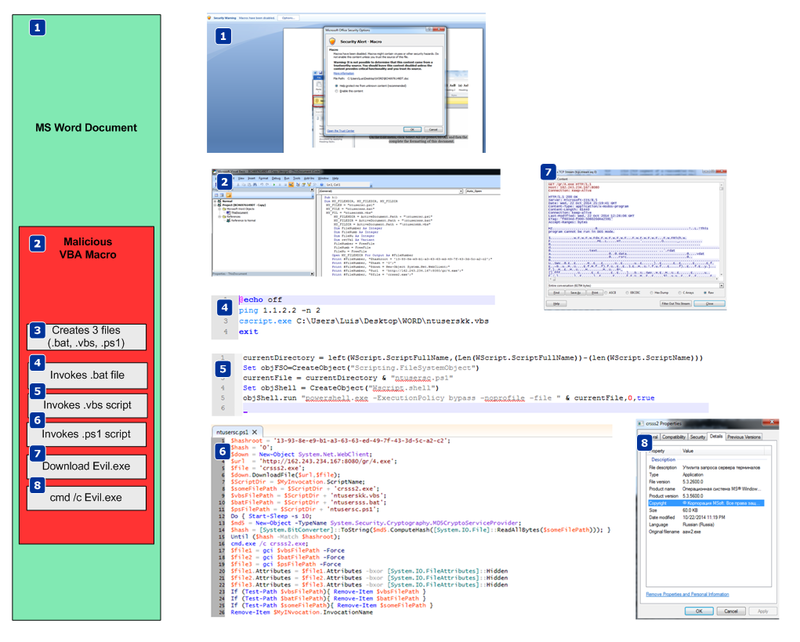 Below a visual analysis of the malware behavior starting with the Winword execution. This graph was made using ProcDOT which correlates Sysinternals Procmon logfiles with packet captures to create an interactively graph. A great tool created by Christian Wojne from the Austrian CERT. This can be of great help for a faster malware behavior analysis. It is also unbelievable to visualize how complex is malware these days. I will leave a how-to on how to produce these graphs for other blog post. From a defense perspective, the US-CERT put together excellent tips for detecting and preventing this type of malware and to avoid scams and phishing attempts applicable to home users and corporations. Note that these documents were not detected by the AV engines at the time the phishing campaign was seen. Virustotal was reporting less than 5% detection rate. Even running on a limited privileges user account the attack would still be successful. A key recommendation is to use Enhanced Mitigation Experience Toolkit 5.0 from Microsoft as part of your layered defense. This is a free product from Microsoft for the endpoint and will prevent the execution of the attacks described previously and many others. Exploit mitigation technologies do not guarantee that vulnerabilities cannot be exploited. However, they raise the bar and increase the costs for the attacker to make exploitation successful by making it harder to be executed. On a windows 7 SP1 with EMET 5, when opening the documents and running the malicious VBA macros, EMET would prevent its execution. Email attachments can be dangerous. Use caution with Email attachments!